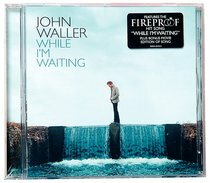 While I'm Waiting was released in April 2009 by Provident Music. Worship leader John Waller seems to have perfected the art of individualizing scripture on While I'm Waiting. Standout tracks include 'Dead Man', with its crunchy guitar licks, and 'Our God Reigns Here', an anthem that does not back down in its proclamations of divine sovereignty. But even with an ample amount of upbeat fare, the album will always be remembered for its most pensive moment, the poignant and reserved title track whose pivotal importance to the hit 2008 film Fireproof secured a place in Christian film history. 2-disc set with 22 songs. :With songs like 'Faith Is Living,' 'Cling to the Call' and 'The Lord Reigns Here,' this writer of declaration-style anthems for the body of Christ is once again giving listeners biblical words to claim as their own during trying and uncertain times. John Waller is a father of three and serves as the worship pastor at Southlink Church near Colorado Springs.